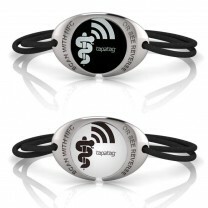 Our new Tap2Tag K1 medical alert bracelet has all of the features of one of our traditional silicone wristbands but now comes with a stylish sterling silver design. The new Tap2Tag medical alert wristband uses NFC technology to allow paramedics and other health professionals get access to your medical information quickly and efficiently. It can also be used with any device that has access to the internet, anywhere in the world. If you are thinking of an upgrade or have just been waiting for a more stylish form of medical alert device then this is the wristband for you. It has an adjustable cord that allows it to fit over the knuckles with a 270mm clearance and can fit a wrist as small as 155mm in circumference. Disc measures 35mm x 23mm.